Having explored horizontal, vertical, diagonal and curved lines I will now consider some of the ways that they can be used in photographic composition. The eye is inclined to follow a line. The more active a line is, the stronger the encouragement for the eye to follow it. When discussing lines, Präkel (2006, p44) advises that lines can be a real or a virtual construct, such as an optical line that connects points. The process of the eye and brain working together to complete things, or close gaps is aligned with the Gestalt Law of Good Continuation. This law states that the mind tends to continue lines and shapes beyond their ending points (Freeman, 2007, p39). the direction in which someone in a picture is looking, known as an eye-line. Implied lines can be particularly useful in composition as they can be used to subtlety direct a viewer’s attention. PART ONE- Look at the two photographs and find the implied lines in each, showing them in a sketched diagram. If the direction of a line is dominant, indicate this with an arrow. 1. In the photograph above there are several implied lines, which I have noted on the photograph. 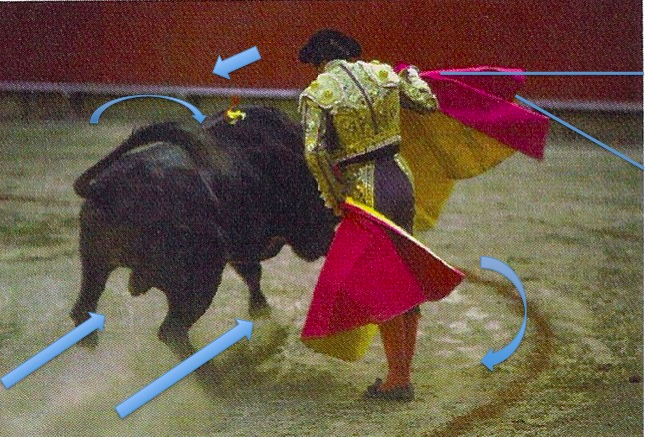 The direction in which the bullfighter is looking, produces an implied line while the direction the bull is traveling creates implied lines as an extension of visible movement. The swish of the bulls tail caused by the movement also creates an implied curved line. The sweep of the bullfighter’s cape establishes a strong diagonal line in the bottom right of the frame which seems to extend beyond the cape by aligning with the curved marking on the ground. The section of the cape in the upper right hand side of the photograph produces ‘real’ lines, which the eye seems to look beyond and extend. 2. The implied lines I noted in this photograph are largely a result of movement and eye-lines with dominant directions, indicated by the arrows. The man is looking ahead at the two horses, while his body suggests he is moving towards the animals. The horses appear to be looking at a point above and beyond the man, while their diagonal posture suggested to me that they were running in a curved direction. PART TWO- Select three photographs of your own, and perform the same analysis. 1. The implied line in this photograph is created by the row of points (buoyancy aids). The eye follows the row around the curves and moves ahead to the buildings in the background. 2. Again, the implied line is created by a row of points, in this case, trees. A curved line is formed at the eye travels from the foreground of the photograph to the background. This curved implied line also mirrors the slight curve of the pathway behind the trees. 3. In this photograph the implied lines are formed as an extension of ‘real’ lines pointing towards the boats in the middle ground. The lines and the overhanging trees create a rough circle shape in the centre. This is aligned with the Gestalt Law of Closure, which states that elements roughly arranged together are seemed to complete an outline shape as the mind seeks completeness (Freeman, 2007, p39). Eye-lines are one of the most valuable implied lines that can be used in composition, for several reasons. 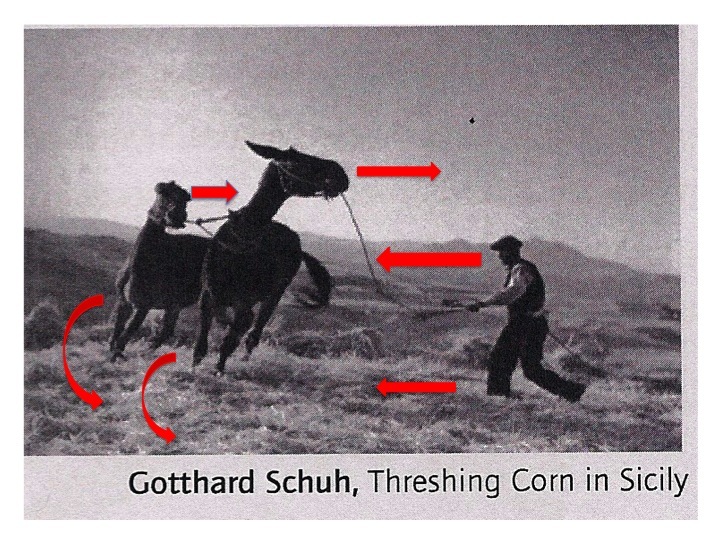 Freeman (2007, p58) notes research by Deutsch and Deutsch (1963) on visual perception, which proposed “importance weightings” as an important factor in visual attention. Generally, certain visual elements will attract people more than others because of prior experience and knowledge. The human face is a subject, which has strong visual weight, especially the eyes and the mouth. Eye-lines also exemplify the Gestalt Law of Good Continuation in action as the viewer follows a person’s line of view to see what may be of interest. For this part of the exercise I went to Dubai Marina looking for suitable subjects and scenes. I have very little experience of taking photographs of people aside from snapshots of family and friends so this exercise gave me a nudge to go out and get some practise. I took this shot of a woman looking across the Marina towards the yachts and high-rise building in the background. I used my telephoto lens set to 78mm with the aperture set to f/5 to keep attention focused on the woman, sharp against the blurred backdrop. While the viewer may not have direct eye contact with the woman in the photograph, the strong visual weight the human face holds will encourage the viewer to follow her gaze across the Marina seeking for clues as to what might hold her attention. When I first came across this scene my eye was drawn to the diagonal line of the fishing rods. I considered the active nature of diagonal lines and how the more active the line, the stronger the encouragement for the eye to follow it. I spent some time viewing the scene from various angles through the viewfinder and waited for a boat to pass on the other side. The shot shows the diagonal line of the rods pointing to the yacht and their tips aligned with the horizontal line of the walkway on the far side of the Marina. I included the vertical mooring poles at each side of the frame to add some dynamic balance to the composition. This exercise has been beneficial, as it has given me some insight as to how the properties of different lines can be used in photographic composition. While, implied lines cannot guarantee that a photograph will be viewed in a specific order they can be helpful as a design element, which can subtlety prompt or steer a viewer’s attention. This entry was posted in 11a-Implied lines and tagged 10. Lines, Freeman, Marina, Photograph on January 29, 2013 by catherinefinniganphotography.